Pallas – Second generation Titan, son of Crius and Eurybia, lover of Styx, father to Zelos, Nike, Bia and Cratus. Greek god of Battle. Pandion (ii) - Mortal king, son of Cecrops II and Metiadusa, wife of Pylia, father of Aegeas, Nisus, Pallas and Lycos. King of Athens and Megara. Parthenopeus - Mortal hero, son of Atalanta and Meleager, or Ares, or Melanion. One of the "Seven Against Thebes". Pasiphae - Minor goddess, daughter of Helios and Perse, wife of King Minos of Crete, and mother of many children including the Minotaur and Ariadne. Pasithea - Charites goddess (occasionally named), daughter Dionysus or Hera, wife of Hypnos. Greek goddess of Rest and Relaxation. Patroclus – Greek hero, son of Menoetius and possibly Sthenele, best friend of Achilles. Suitor of Helen and one of the Achaean leaders at Troy. Periboia - Oceanid nymph, daughter of Oceanus and Tethys, wife of Lelantos, mother of Aura. Perse – Oceanid nymph, daughter of Oceanus and Tethys, lover of Helios, mother of Circe and Aeetes. Persephone – Olympian era goddess, daughter of Zeus and Demeter, and wife of Hades. Queen of the Underworld, and Greek goddess of Spring Growth. Perses (i) – Second generation Titan, son of Crius and Eurybia, wife of Asteria, father of Hecate. Greek god of Destruction. Perses (ii) - Mortal king, son of Helios and Perseis, brother to Aeetes, Circe and Pasiphae. King of Tauric Chersonese and Colchis. Perseus - Demi-god, son of Zeus and Danae, husband of Andromeda, and father of the Perseids. King of Mycenae and vanquisher of Medusa. Phaethon (i) - Astra Planeta god, son of Astraeus and Eos. Greek god of the planet Jupiter. Phaethon (ii) - Son of Helios and Clymene, adopted son of Merops, brother of the Heliades. Phainon - Astra Planeta god, son of Astraeus and Eos. Greek god of the planet Saturn. Phanes - Protogenoi god, born from the World Egg at beginning of time. Primordial god of the Orphic Tradition. Philoctetes - Mortal hero, son of Poeas. King of Meliboea, hero of Trojan War and present in Wooden Horse. Philonoe - Mortal princess, daughter of Iobates, sister of Stheneboea, wife of Bellerophon. Phocus - Mortal, illegitimate son of Aeacus by Psamathe, brother of Telamon and Peleus. Gave name to region of Phocis. Phoenix – Mortal king, son of Agenor and Telephassas, brother of Cadmus and Europa, husband of Cassiopeia. Founder of Phoenicia. Phorcys - Early sea god, son of Pontus and Gaia, husband of Ceto, father of Echidna, the Graeae and Gorgons. Greek god of the hidden dangers of the sea. Phrixus – Mortal, son of Athamas and Nephele, husband of Chalciope, father of Argus, Cytisorus, Melas and Phrontis. Pleiades - Group of nymphs, seven daughters of Atlas and Pleione. Attendants of Artemis and nurses of Dionysus. Pleione – Oceanid Nymph, daughter of Oceanus and Tethys, wife of Atlas, and mother of Hyas, the Hyades and the Pleiades. Plutus - Minor god, son of Demeter and Iasion. Greek god of Agricultural Bounty and Wealth. Poeas - Mortal king, father of Thaumacus, father of Philoctetes. King of Meliboea. Pollux - Immortal hero, son of Zeus and Leda, brother of Castor, Helen and Clytemnestra. Hero present amongst the Argonauts. Polydectes - Mortal, son of Magnes. King of Seriphos, suitor of Danae, and setter of Perseus' quest. Polydorus (i) – Mortal king, son of Cadmus and Harmonia, husband of Nycteis, and father of Labdacus. King of Thebes. Polyhymnia – Younger Muse, muse of religious hymns, daughter of Zeus and Mnemosyne. Polymede – Mortal, daughter of Autolycus and Amphithea, occasionally named wife of Aeson and mother of Jason. Polyphemus – Second generation Cyclops, son of Poseidon and Thoosa, lover of Galatea. Pontus - Protogenoi, son of Gaia. Primordial Greek god of the Sea. Poseidon – Olympian god, son of Cronos and Rhea. Greek god of the Sea and Water. Procris - Mortal princess, daughter of King Erechtheus of Athens, brother of Cecerops, husband of Cephelaus. One time owner of Laelaps. Proetus - Mortal king, son of Abas and Aglaea, brother of Acrisius, husband of Stheneboea. King of Tiryns. 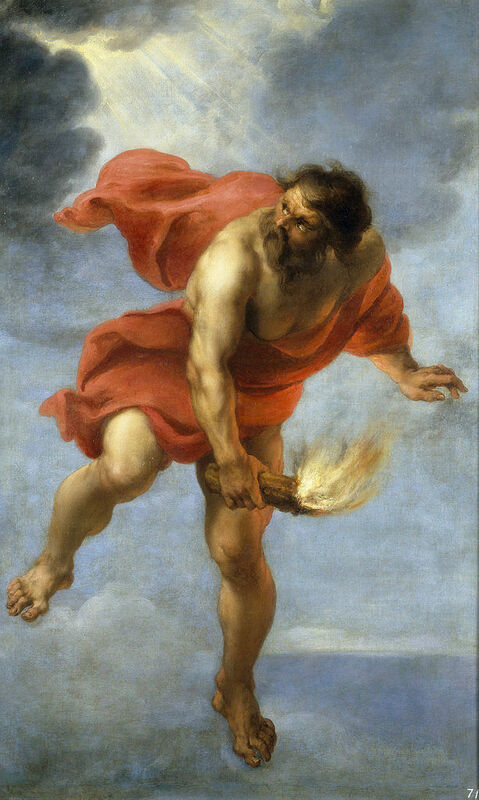 Prometheus – Second Generation Titan, son of Iapetus and Clymene, husband of Pronoia, and father of Deucalion. Greek god of forethought. Pronoia – Oceanid daughter of Oceanus and Tethys, husband of Prometheus, mother of Deucalion. Greek goddess of Foresight. Proteus - Sea God, son of Poseidon, husband of Psamathe, father of Eidothea. Found on Lemnos. Greek god of Seals. Psamathe - Nereid nymph, daughter of Nereus and Doris, wife of Proteus. Beloved by Aeacus, and mother of Phocus. Greek goddess of Sandy Beaches. Pylas - Mortal king, son of Cteson, father of Pylia and Sciron. King of Megara and Pylos. Pylia - Mortal queen, daughter of Pylas, sister of Sciron, mother of Aegeas, Nisus, Pallas and Lycos. Queen of Megara. Pyroeis - Astra Planeta god, son of Astraeus and Eos. Greek god of the planet Mars.